One of my all time favorite movies is the 1922 German Expressionist silent horror film Nosferatu, an early cinematographic take on the Dracula story that includes many haunting images. 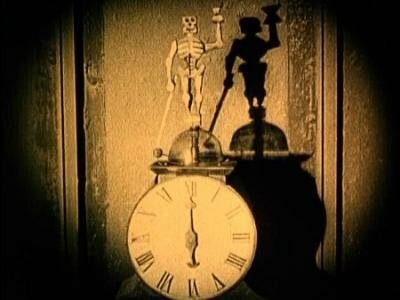 One of them is a mantelpiece clock that strikes the hours by an automated hammer-wielding skeleton. It's a classic memento mori, a reminder of death's relentless approach and a stimulus to the wisdom that comes with that knowledge. People once decorated their homes with such objects for the purpose of attuning the mind to ultimate questions that we might otherwise treat lightly.